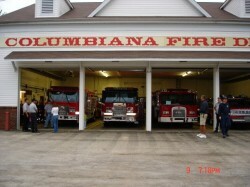 The Columbiana Fire Department is a Paid Volunteer Fire Department. The Station is not manned. Dispatch services are maintained and operated by the Columbiana Police Department. Dispatch can be reached 24 hours a day, 7 days a week at the location and numbers below. The Fire Station is located directly across the street from the Police Department.